Program for Excellence in Selling students Ricardo Guerra, second from right, and Nicole Pinkelman, far right, placed as third runners up during the National Collegiate Sales Competition. Also pictured (from left) Sonya Brooks, contributor and 2012 national championship competitor, 2nd overall, Raul Giron, alternate, Juan Rueda, alternate, Kyle Jarrell, contributor and PES program manager and Amy Vandaveer, co-coach. 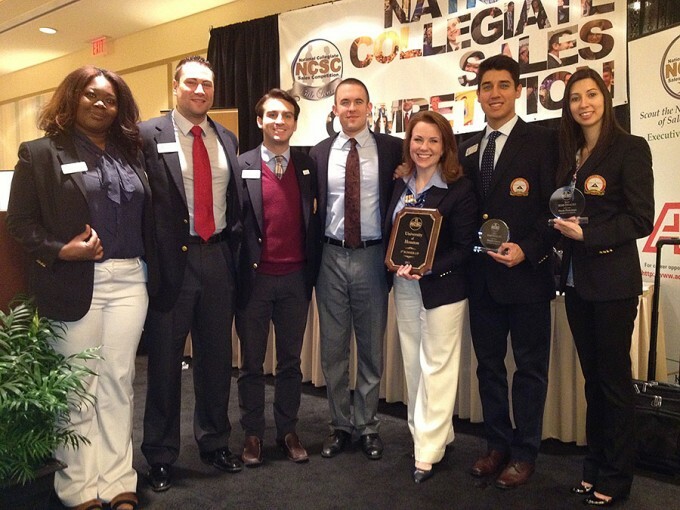 A team of four students from the Program for Excellence in Selling at the University of Houston C. T. Bauer College of Business recently placed as third runners up at the 2013 National Collegiate Sales Competition held at Kennesaw State University. Competitors Nicole Pinkelman, who placed fifth overall, and Ricardo Guerra, who placed in the top 15, together claimed third place runners up out of 67 schools from U.S. and Canada with team alternates Raul Giron and Juan Rueda. The University of Houston, ranked first in the preliminary standings after back-to-back national championships and over ten years of elite competition history, were the most recognized school at the competition. The competition required the 134 students to prepare a sales presentation for a mock meeting with a buyer lasting 20 minutes. Each competitor was recorded and graded by a judging panel on criteria, such as needs identification, approach and communication skills. With numerous competitors and elite sales talent, companies were in full force to recruit, giving the University of Houston students an even bigger opportunity. Overall, the competition offered a special experience for yet another group of PES students. Receiving several national champions in its history, current coaches Amy Vandaveer, Marketing lecturer at the Bauer College, and Taylor Herbert, a sales professional at Tom James, PES alumna and former competitor of the 2011 national championship team, are proud of the team and what University of Houston has amassed over the years. As the students celebrate their current success, they are already looking forward to helping those who come after them.